Top 10 Reasons Over 30 Men And Women Should Compete In Bodybuilding! When’s the last time you felt the adrenaline rush of competition? Heard people cheering for you? 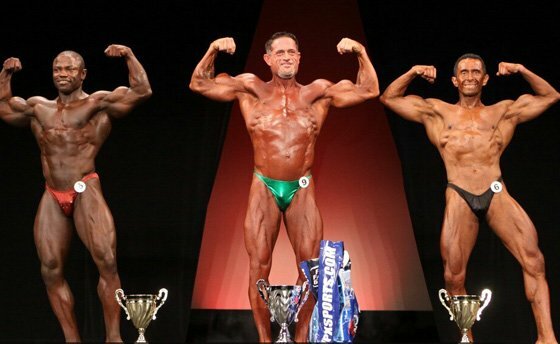 Here's the top 10 reasons you should compete in a bodybuilding show even if you're over 30! Find out more below. When's the last time you felt the adrenaline rush of competition? Had to take a nervous pee before you stepped on the field? Stared into the eyes of guys that wanted the championship as much as you? Heard people cheering for you? Unfortunately, for most grown-ups real competition is a distant memory replaced, instead, with the thrill of coming to bat with bases loaded in the church softball game or the challenge of trying to beat a record time in the daily commute or getting way too excited on the sidelines at your 7-year-olds soccer game. Get one of your 30 and 40 something friends to compete with you. Why compete at our age, you ask? Indeed, I suggest that our age is the best at which to compete. Think "keeping your edge". Think "avoiding dry rot". Need I say more? I know that my wife loves showing her friends 4x6's of me all tanned and looking buff on stage. Unlike the famous backstage psyche-outs portrayed in Pumping Iron, my experience backstage has been one of the best parts of the shows. We're a bunch of beautifully fit men and women competing for the fun of it and cheering each other on. It's inspiring, really. There aren't a lot of sports where 40-year-olds consistently out-perform 20-year-olds, but natural bodybuilding is one of them. The 40+ class is often the best class of the show and a 40-something is almost always at or near the top of the open classes, too. How cool is that? Contest prep is intense, there's not doubt about it; dieting, training, cardio, and posing practice all precariously balanced with work and family. Take some time off after your show, you'll deserve (and need) it. The shows that I've been to give you an index card at the morning check-in and ask you to write out your "thank yous"; then at the evening show the MC reads your card before you pose. It's cool to be able to publicly thank your "beautiful wife" and "amazing kids" for putting up with you. That's right, you accomplish all that and provide wifey with drool-worthy pics AND get a t-shirt all in one fell swoop. Preparing for a show and getting on-stage provides a real "Is it in me?" challenge. Anyone can workout and build muscle. But do you have what it takes to train for a show and step on stage? Is it in you? Find out! Having a decent set of guns and living at 15% body fat ain't rocket science. Any schmuck can do it. Contest prep, on the other hand, requires some new and different thinking, reading, and studying about everything from training and diet to self-tanning products and posing trunks. Homework you'll actually enjoy! When's the last time you competed in anything? (Slow-pitch softball and Scrabble tourneys don't count.) I'm talking about competition where you're putting it all out there; where you're ready to collapse when you walk off the track/field/court/stage; where there's a couple hundred people watching and cheering for you (or the other guy). That's a bodybuilding show. And that kind of competition helps you keep your edge in life. The reality is that for most folks our age the "glory days" are so far in the rear view mirror that their kids don't even recognize mom and pop in pics from college. "That was you, Mom?" or "You played sports, Dad?" Even if you have retained a semblance of your former bod, I guarantee that when you step on stage for the first time you will be in the best shape of your life. That's priceless. And totally spend the $100 or so for some backstage studio shots. You won't even believe how good you looked!